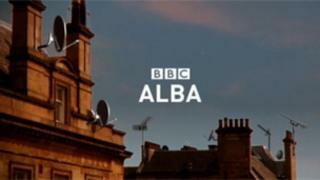 When BBC Alba was launched in 2008, as a collaboration between the BBC and the Gaelic TV body MG Alba, it was a huge achievement for supporters of the Gaelic language. They had long argued a dedicated channel would provide a better service for Gaelic speakers than individual Gaelic programmes on the major channels. They also argued that a dedicated Gaelic channel could play a major role in helping to safeguard the future of the language itself. Uniquely for a BBC service within the UK, it is a joint venture. Some of the programmes are paid for by the BBC - others are the responsibility of MG Alba, funded by government money. However, there was disappointment once it became clear that the channel would only be broadcast on satellite TV - watched in 43% of Scottish homes - although programmes can also be accessed online through the BBC Iplayer. Supporters argued it was vital that the channel should also be broadcast on Freeview, like all the other public service channels. BBC management came up with a plan which would make this possible. The downside was that it would mean that the BBC's radio stations would have to come off Freeview whenever BBC Alba was on the air. The BBC Trust put off a decision earlier this year as it was also due to carry out a wider review on how all BBC services should be broadcast. Deciding between the merits of BBC Alba and the radio stations was a difficult decision. It has now backed the scheme after extensive research, although no date has been set for BBC Alba's appearance on Freeview. Some are hopeful it will be appear on Freeview by the time the digital switchover takes place in central Scotland next May and June. In practice, BBC Alba will be available in almost every home in Scotland and the challenge for the station will be to demonstrate that it can offer value to as many people as possible and appeal to viewers who cannot speak Gaelic. Some newspaper commentators have claimed it is difficult for Alba to show it is doing this, as normal viewing figures are not available for the station. Instead, other forms of research have been used. It is understood one reason for this is that the sample used to compile normal ratings does not include viewers in the islands of Scotland. Although the BBC's radio stations will no longer be broadcast on Freeview once this happens, it is possible that they may return in the future as a result of technological improvements. Despite this, the main radio stations will still be broadcast on FM and medium wave as usual while the digital stations - such as 1 Extra and BBC7 - will still be available on satellite, cable, through digital radios and online. However, the alternative to this could have involved the BBC buying capacity on another part of the Freeview system at commercial rates - capacity which might not have been able to reach viewers served by relay transmitters. The BBC Trust has also ruled that Gaelic programmes should remain on BBC Two Scotland, although it will no longer be specified as the BBC's key channel for Gaelic. However, the way Gaelic is scheduled on BBC Two Scotland is changing. Gaelic programmes were broadcast in a two-hour block on Thursday evenings until recently. Individual programmes are now appearing in a variety of slots across the schedule although the overall amount of Gaelic in peak viewing hours should stay the same.